Peter is lovesick for the pretty neighbor girl, Mary Jane Watson (Kirsten Dunst), and wishes he could be close to her, like her brawny boyfriend. But Peter is a brainy geek, who the other kids delight in tormenting. Superpowers are thrust upon him courtesy of a genetically modified spider that bites him on the hand while he’s visiting a laboratory on a school field trip. Soon afterwards he discovers he has capabilities that he doesn’t understand. He can now deliver devastating punches and his reactions are so quick that everyone else seems to be moving in slow motion. More significantly, however, webbing now shoots from his wrists, and when he needs to climb—like up the side of an office building—Velcro-like hairs emerge from his palm and fingers. No, this new Hollywood take on superhero-lore bears little resemblance to Batman. But it’s not all that different than Superman—just imagine a different origination story. This time, instead of Lois Lane wondering who Superman really is, while poor Clark Kent suffers from lack of attention, Mary Jane (Dunst) dreams of Spider-Man while nerdy Peter Parker moons over her. We even get scenes amazingly similar to the transformation scenes from Superman, but Peter doesn’t use a phone booth when it's time to change into his Spider-Man garb. He just runs for an alley. And while Peter can’t exactly fly, he soon enough learns to soar by swinging on strands of spider webs. Spider-Man is like Superman with teenagers in the hero and heroine roles. Not much is really made of Peter’s intelligence. Aside from his geekiness, he’s a fairly ordinary kid (in spite of his laments about not being ordinary). As a result, Spider-Man remains trapped by Raimi’s lack of imagination. 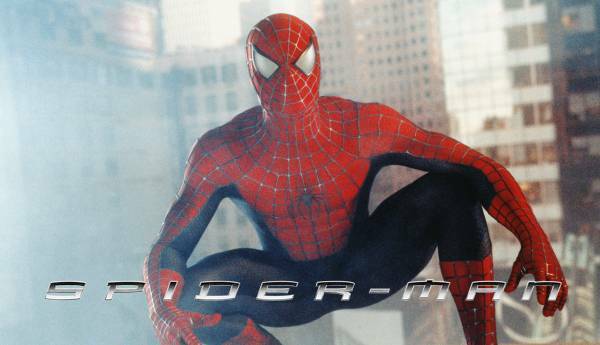 Spider-Man is certainly fun to watch, in a bland, seen-it-all-before sort of way. It certainly isn’t a bad movie, but neither is it the kind of movie to really get excited about. However, after the advertising blitz that we all have endured over the past few weeks, many moviegoers are no doubt primed to consider this the greatest blockbuster of all time … or at least of the past three or four months, anyway. Spider-Man is a wonderfully energetic tale, but it’s as bland as Peter Parker. We get a few hints that Raimi has more in store for his leading character, and maybe that depth will appear in future episodes of this superhero franchise. It's almost guaranteed to. At one point, Peter laments about not being able to have a normal life, but at this point in the Spider-Man saga, his lament doesn’t carry much weight. It's just a hint of what may come. It’s an interesting idea and it indicates that Peter Parker will find that being a superhero carries a big downside; however, Raimi isn't particularly interested in following through. At least not right now, anyway.